Both buses and trams will be run by new company Transport for Edinburgh once the project is up and running. Passengers in Edinburgh will be able to use one ticket to get on both buses and trams once the new system is up and running. On Thursday, councillors revealed plans for Transport for Edinburgh, a company which will be set up to run both Lothian Buses and the trams project. Integrating the transport systems will mean users will be able to use a smartcard ticket, similar to the current Ridacard bus pass, on both types of transport. Daytickets and other multi-journey tickets will also be transferable between the two. The Scottish National Entitlement cards, giving those over 60 and disabled people free bus travel, will be valid on the trams but only for Edinburgh residents. There will be a flat fare for the network, except for journeys beyond the Gogar depot to Ingliston park and ride and Edinburgh Airport. 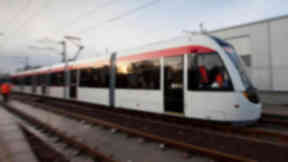 Details of ticket and timetabling for the trams have been revealed in a City of Edinburgh Council report which is due to go before full council next Thursday. The business plan also sets out a timetable for the trams, saying they will be running between 5am and midnight seven days a week. During peak weekday times, eight trams will run every hour, off peak weekdays and weekends will see six an hour. Bus routes which will overlap with the tram route will be changed. The Ingliston park and ride bus X12 will be replaced by the tram and the airport bus will be reduced to every ten minutes. The report also says the project is running in line with the revised £776m budget and timetable. 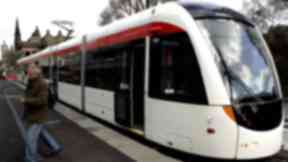 The deadline for the project is summer 2014 but council officials are “confident” the trams will be running before then. The date for the completion of the project will be announced at the end of September. Cllr Lesley Hinds said: "Edinburgh’s new tram service is fast approaching and we’re developing the service in a way that fully complements our award winning bus service. "With their existing knowledge and expertise Lothian Buses in very well placed to thrive with the tram and I’m very pleased that we’re working in partnership with them. "The tram and bus services will be fully integrated with tickets and timetabling delivered through one system to make journeys easier. Any profit made will go back into Edinburgh’s transport system." Ian Craig CEO of Lothian Buses said: "This is a very welcome development for the city, its residents, visitors and businesses. "Particularly in the immediate term, this allows the transport provision of bus and tram to the public to be integrated and presented as one multi-mode offering to our customers, rather than distinct and separate entities."